The Bungalow Restaurant in Corona del Mar hosted a fundraiser this week on behalf of Laguna Beach resident Katie Ford, who experienced a medical emergency and crashed her vehicle into the empty restaurant last week. “We want to do whatever we can to help get Katie on the road to recovery and help secure some financial support for her and her daughters during this trying time,” said co-owners Jim Walker and Louie Feinstein in a statement. The single mother is in a medically induced coma and her children are in the care of grandparents, says a statement. 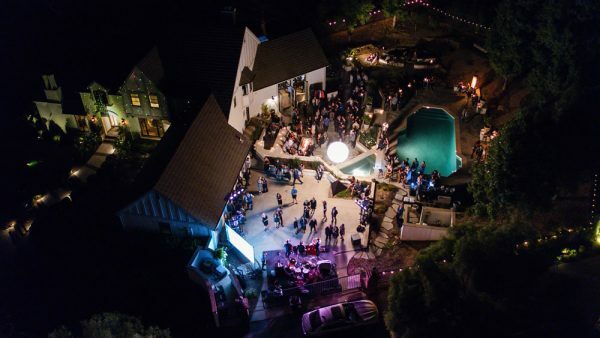 Dr. Sten and Elizabeth Kramer opened their home last month for a Wheels 4 Life benefit, which hosted performers Charles Colin, Stan Frazier and Scott Owen and Chevy Metal. The gala raised $92,00, enough to provide 1,000 bicycles for projects in Guatemala, Uganda, Malawi, Nepal and Kenya, says a statement from the Laguna Beach foundation’s co-founder Carmen Rey. A bicycle can make getting an education, obtaining healthcare and earning a living possible, she said. Mountain biking pro Hans Rey presented four short videos and Lynn Walworth showed images of recipients of 100 bikes in Rory Walworth Square in Kenya, in memory of son Rory. An overhead scene of the Rock 4 Bikes gala organized by mountain bike champ and local resident Hans Rey. Discover the beauty, ease and simplicity of gardening with bulbs by joining master gardener Mary Duffy on Saturday, Nov. 11, from 9 – 10 a.m. at the Community & Susi Q Center, 380 Third St.
For more info: 949 464-6645. A town hall meeting to explore the city’s cultural infrastructure is planned for Wednesday, Nov. 8 at 6:30 p.m. in the Community and Susi Q Center, 380 Third St.
Attendees are invited to bring an example of a cultural space or public art activity they find interesting to the meeting. For information contact Siân Poeschl at 949 497-0727. Kristina Fulep and Alice Wu, participants in La Playa classes. 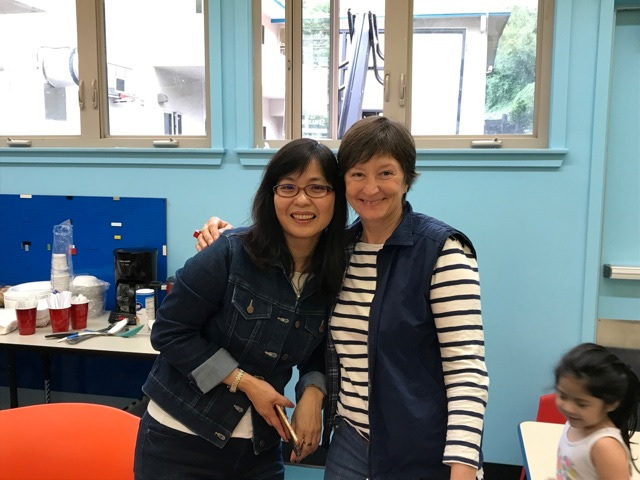 La Playa Center began its 23nd year offering free English-as-a-second-language classes plus childcare in space donated by the Boys and Girls Club in September. As in every year past, its students hail from all points. This year’s students are natives of Thailand, Taiwan, Turkey, Belarus, Russia, and Hungary. They represent half a dozen languages, including Spanish, Russian, Chinese and Hungarian. Co-directors Bonnie Teder and Janet Waters and 12 volunteer teachers teach classes in three levels, an example of the Laguna community helping recent immigrants adjust to their new home. One form of recompense is the thanks they receive from students comfortable enough in English to talk with their children’s teachers and navigate the local community. The Anti-Defamation League honors Laguna Beach residents Sarah and Joe Kiani with its Humanitarian Award at a $500-a-person gala next month at the Beverly Hills Hotel. Joe Kiani is chief executive officer and chairman of Irvine-based Masimo Corporation, a medical technology company he founded in 1989, which now employs 4,500 people. Sarah Kiani serves on the board of the Masimo Foundation for Ethics, Innovation, and Competition in Healthcare, which focuses on improving patient care. The couple has spearheaded efforts to aid refugees and funded schools in Uganda. For reservations call 310 446-4260. Advice on grieving during the holidays is offered in a workshop led by Laguna Beach local, the Rev. Jon Moore, and Deborah Sakach, from 4-5:30 p.m. Tuesday Nov. 14. It takes place at Laguna Presbyterian Church, 415 Forest Ave., and there is no cost to attend or registration required. Contact the church office with questions: 949 494-7555. 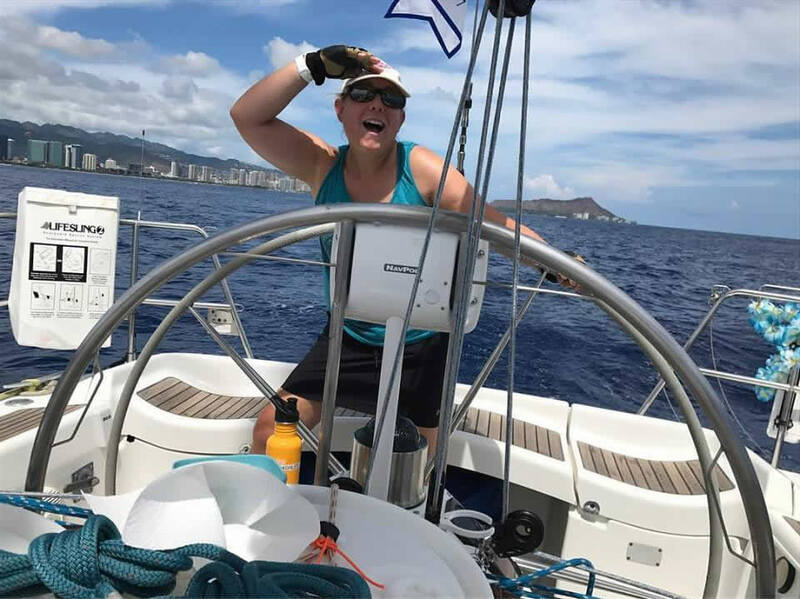 Three participants in the 2017 Transpac Race, the bi-annual regatta from Long Beach to Diamond Head, Hawaii, will share stories from their 2,000 mile journey at 6:30 p.m. Tuesday, Nov. 7, with the Women’s Sailing Association-Orange County. A Transpac racer offshore Hawaii. The group meets at the Aventura Sailing Association in Dana Point Harbor. For more info: visit www.wsaoc.org. Biologist Richard Halsey of the California Chaparral Institute will focus on the beauty and benefits of chaparral and living in a fire-prone environment at 6 p.m. Thursday, Nov. 16, the first in a free city-sponsored lecture series. The lecture takes place in the Community Center, 380 Third St.
Halsey, who works with the San Diego Museum of Natural History and is a longtime educator, has written about and discussed how communities can adapt to fire-prone environments for the past decade.